Nebula Collection by Bestar is the ideal solution for organizing small spaces with multiple purposes. With crisp, modern lines, create your dream layout by combining the different units to meet your needs according to the available space. This kit includes two 25 inch storage units, two doors, two 3-drawer sets, a base unit and a bridge. Each 25 inch Storage unit has 2 fixed and 3 adjustable shelves to maximize your options. The reversible doors provide closed storage on upper section of the storage unit. The base unit has 1 adjustable shelf. 6 clothing rods are included in this kit. Easy to install. Assembly required. Stackable Storage Organizers are a convenient way to hold shoes, hobbies, media and office supplies. Use in or out of the closet to store t-shirts, shoes and accessories like scarves, sweaters and denim. Designed to work perfectly with other Stackable Storage Organizers. 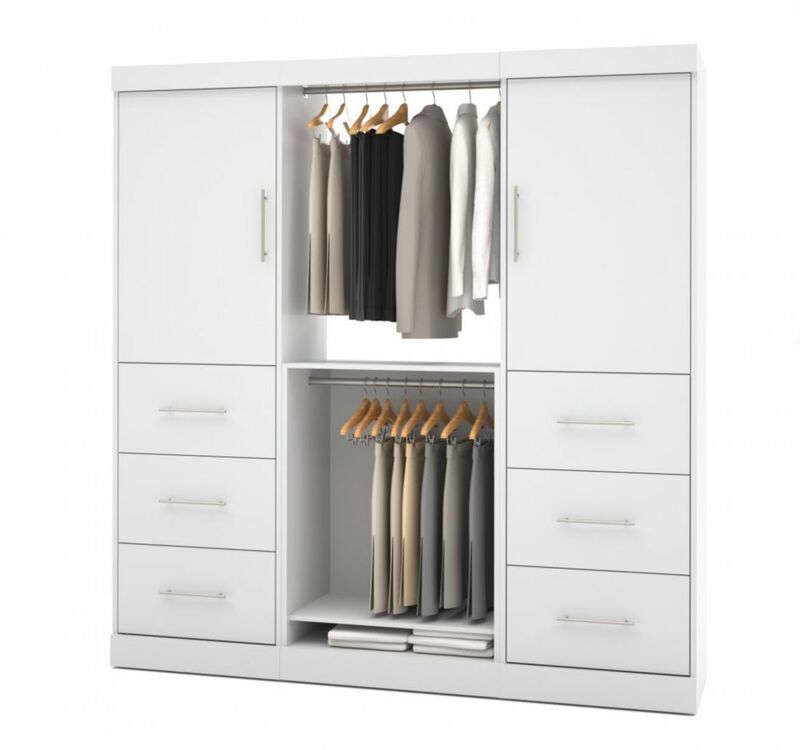 Nebula 80 inch Storage kit with 6 drawers - White Nebula Collection by Bestar is the ideal solution for organizing small spaces with multiple purposes. With crisp, modern lines, create your dream layout by combining the different units to meet your needs according to the available space. This kit includes two 25 inch storage units, two doors, two 3-drawer sets, a base unit and a bridge. Each 25 inch Storage unit has 2 fixed and 3 adjustable shelves to maximize your options. The reversible doors provide closed storage on upper section of the storage unit. The base unit has 1 adjustable shelf. 6 clothing rods are included in this kit. Easy to install. Assembly required.